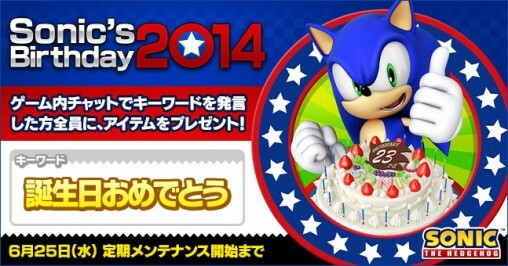 Did you know that Sonic’s Birthday is on June 23rd? For a limited time, you can acquire Sonic related items from the FUN Scratch and 2nd Anniversary FUN Shop! 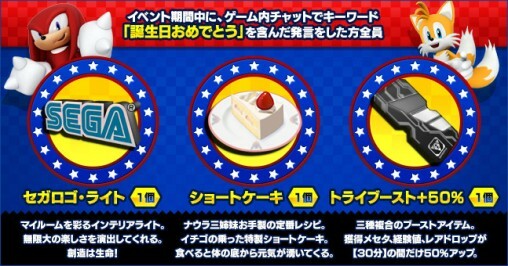 But if you wish Sonic a happy birthday during the event period, you’ll receive several prizes. Other words and punctuation can be used before or after the phrase. However, if you break up the phrase by adding in punctuation 「誕生日、おめでとう」, or break up the phrase on two or more lines, or say the phrase in English 「Happy Birthday」, or use the wrong kana 「たんじょうびオメデトウ」, you will not qualify for the prizes. The prizes will be distributed mid-July at the Visiphone. If you are using a mobile device or an external application, please [sync] the calendar after maintenance has ended. Boost Events that occur for 24 hours will be posted in this calendar with the duration of 1 minute. This change was made to make the calendar easier to read when viewing the events as a list. Boost Events that occur for several hours will now use the “Period” suffix in their titles. You still need to check the Google Calendar itself to see how long it will last as this will not be displayed in the sidebar. Spend certain amounts of AC during the campaign period to receive prizes at a later date. AC/iAC used in PSO2es with a linked account will qualify for this campaign. However, any AC/iAC used in PSO2es prior to linking will not qualify for this campaign. What’s with the super early maintenance, they’re not even adding content this week, are they? If they’re working on the server hardware, that’s going to add quite a bit of time to the maintenance. They may be changing out servers or replacing faulty hardware. It probably takes 10 hours just to get of that horrible song off the servers that they play over and over and over again. Can’t get out of my head. You mean the Sonic Adventure 2 remix theme or something like that? Talk about a pain. I can’t stop putting off my headphones when I’m on lobby just no to ear it. That’s the first time I do it since I began playing… But I believe it’s not the first time it was put as the Lobby theme. stupid earworms… bring back the attack on Titan one! Good they are working on server equipment , perhaps after the update it will be less laggy..well done sega, actually got your priorities straight for once. If I get IP banned and unable to stay logged with a VPN because of them then this will be my last online game. That happened to you, too? I was doing the limited quest and got the pm from “PSO2HACKS.com” with “test.” Then I died, and my client crashed. Didn’t have a problem since, but glad it wasn’t just me. Honestly, I haven’t been paying too much attention to the block I am on. I just search for party on current block, and then other blocks if there aren’t any. I was in a Hard instance of the limited quest, though. the blocks are set up so you can party with people near your ability lvl. 04 and 05 for hard – 06 and 07 for VH – and 10-19 for SH. doing an eq in b20 is not advised – that’s pretty much a social only block unfortunately. I got it on 209 or 210 IDR. I was stupid for not taking a screenshot and panicked to log off as fast as I could. Also it was close to the update day. Wednesday around 3PM ET/Caribbean time. i got that too but didnt died, just… got the PM, i was on a mission, maybe was it. never saw that again…and i hope that i dont see it anymore. well if they are working on improving server stability, then good..
Can’t stick around, hafta keep movin’ on! Guess what lies ahead, only one way to find out! I’ll make it through, prove it to you! Interesting to see that there’s actually a sizeable amount of main hunters. I thought the previous released statistics were only so high due to everyone subbing the class. The statistics puzzle me (why so many humans? ), but at least we can say so much for Cast Supremacy eh? And at least more people are making men now. They’re the best, and have the greatest AC outfits~! All other races can go home, no contest. Are English Vita user SOL with the “Happy Birthday” promotion because we can’t use Japanese Kana? You can. Go to the Vita settings and add the japanese keyboard from the languages option. I think you read it wrong. Twitter says that the update for June 25 will be postponed until further notice and Sega will release a follow up this June 24 1500 JST. It is still unclear when the servers will resume its service again.